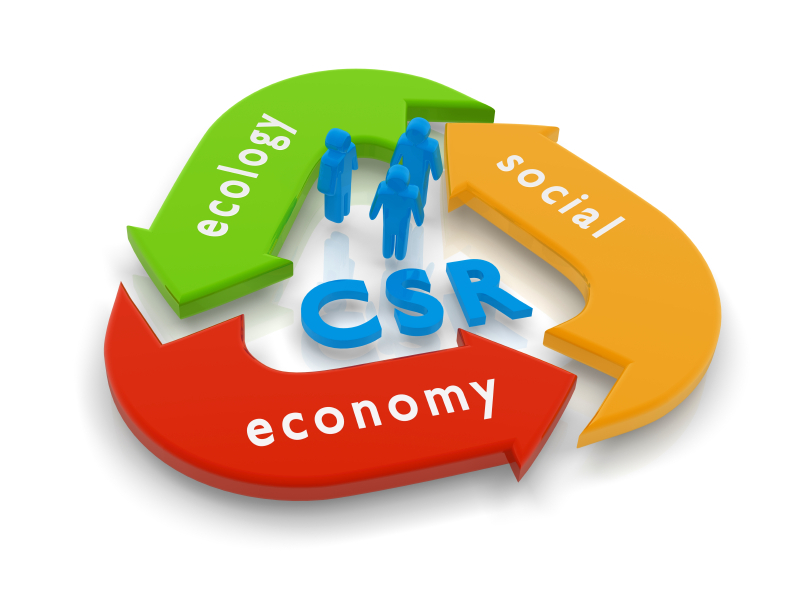 What does Corporate Social Responsibility (CSR) mean? Can it be measured? What are the benefits of adopting a CSR policy as part of your business practice? Sustainability guidelines from the Global Reporting Initiative (GRI), and ISO 26000 Guidance on Social Responsibility offer helpful starting points. Contributes to sustainable development, including the health and welfare of society. Complies with applicable law and is consistent with international norms of behavior. Respect for international norms of behavior. The traditional measurement of a company’s viability is its financial bottom line. Is it covering costs? Is it making a profit? Are investors and customers satisfied with prices and profits? Is it avoiding fines and other costs related to regulatory non-compliance? Now, companies are turning to triple bottom line (financial, social, and environmental) reporting to measure their sustainability. These values are reflected in the main principles of CSR. How do companies apply these principles in a practical way? The principles are general enough to allow each organization to interpret them in ways useful for their own situation, whether the organization is a food processing plant or a law firm. Here are examples of how two very different companies each created a CSR policy that reflects their needs. Kellogg, a multinational food manufacturing company with factories in nearly 20 countries, names the “four pillars” of its plan as marketplace, community, environment, and workplace. Its 2013 CSR report (read here) describes its intentions to reduce energy consumption, amount of waste sent to landfills, and greenhouse gas emissions. Their recently updated EHS policy, part of the workplace “pillar,” has reduced the number of workplace injuries and time lost due to injuries. Kellog’s CSR policy extends to its suppliers as well, with a code of conduct stressing the importance of regulatory compliance, recordkeeping, product safety, and a safe work environment. Its Global Supplier Code of Conduct states that Kellogg buys from producers whose practices protect forest and peat lands and respect human rights and community rights, including the rights of local and indigenous communities to have a voice in planning and development projects that would affect them. Kellogg promotes its CSR on its website, and its other policies, such as its Palm Oil Commitment and Climate Policy, all work to support the aims of its CSR policy. Borden Ladner Gervais (BLG) is the largest Canadian law firm.1 Its “products” are its employees, and its CSR policy focuses on developing the expertise and abilities of its workforce as well as its community connections. The main projects under its CSR policy are diversity and inclusion, pro bono work, women’s leadership, scholarships, and community literacy programs. By publicizing its activities in a CSR report, BLG promotes its intentions to clients, potential clients, and current and potential members of the firm, attracting those who share its values. BLG is a member of the Canadian Law Firm Diversity and Inclusion Network and sponsors a national Black Business and Professional Association scholarship fund, Pride at Work Canada, and the Justice Project, which promotes practices intended to retain women lawyers and advance their careers within the company. BLG also participates in a number of professional networks and training programs. Its community links are established through initiatives such as pro bono work and a program for literacy volunteers. It considers the pro bono work as both a way of “making meaningful contributions to the lives of others” and offering lawyers the opportunity “to pursue things they are passionate about.” The literacy program, in which lawyers participate in a volunteer program of reading to elementary school students, is BLG’s longest-running community project. What are the benefits of insisting that the company supplying you with palm oil subscribes to a policy that protects local forests, if that is not a legal requirement? Why would a high-profile lawyer spend time during a work day with a 10-year-old student to read out loud together? It comes back to the concept of the triple bottom line—financial, social, and environmental. Better Business Journey, a UK Small Business Consortium, claims that “88% of consumers said they were more likely to buy from a company that supports and engages in activities to improve society.” (Read more here). Many business consultants note that having (and promoting) a CSR policy distinguishes your business from the competition and makes you more attractive to investors, employees, and customers. Poor reviews and bad-news stories quickly “go viral” in a wired world, but a CSR policy creates systems and programs that improve performance and demonstrate community involvement—stories that will also become public knowledge, to the benefit of the company. BLG’s CSR policy aims to improve its product—lawyers and legal expertise. It also enhances its public reputation. Kellogg’s CSR policy results in safer food, produced in environmentally sustainable ways—and it considers its environmental management system as part of that policy. In fact, many ISO 14001 Environmental Management System (EMS) auditors note that an EMS can strengthen a CSR policy. The new challenge to business is balancing its corporate needs with the social, economic, and environmental needs of the broader community. Companies that ignore the demands of its stakeholders—customers, stockholder, even its employees—are not likely to stay in business in an ever-more competitive world. Companies that embrace the principles of CSR find practical benefits beyond an enhanced reputation. 1From http://www.blg.com/en/AboutBLG#tabs-1 which cites BLG is the largest law firm in Canada according to The 2013 Lexpert®/American Lawyer Guide to the Leading 500 Lawyers in Canada.